Kick Start Your Day with Spaghetti Muffins! There are so many pasta cookbooks out there that one would have to assume this humble food of basically flour and eggs, supplemented by some liquid, is not only universal, but so diverse that almost no one doesn’t like pasta in one form or another. In addition to cultural differences in pasta preferences, recipe ingredients and preparation methods, pasta is still pasta. 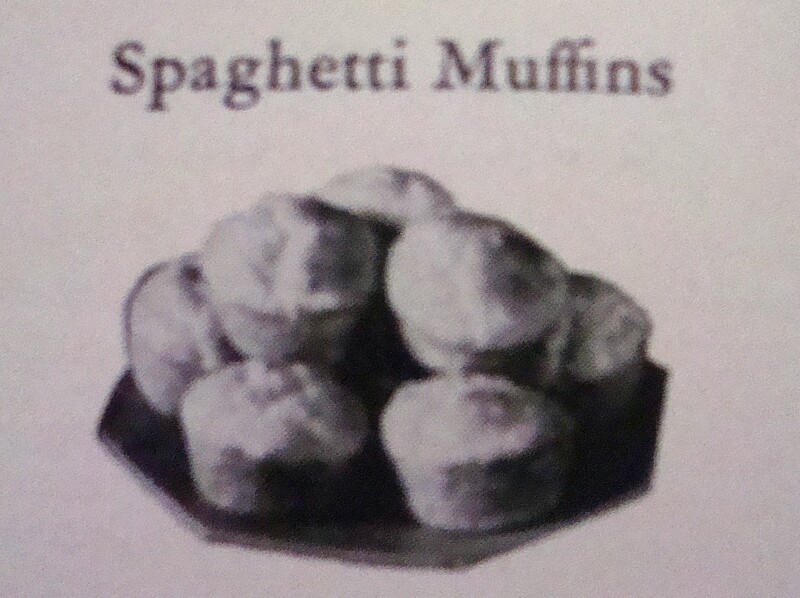 I was amused, in looking through some of my older cookbooklets, to find some unusual recipes using pasta. 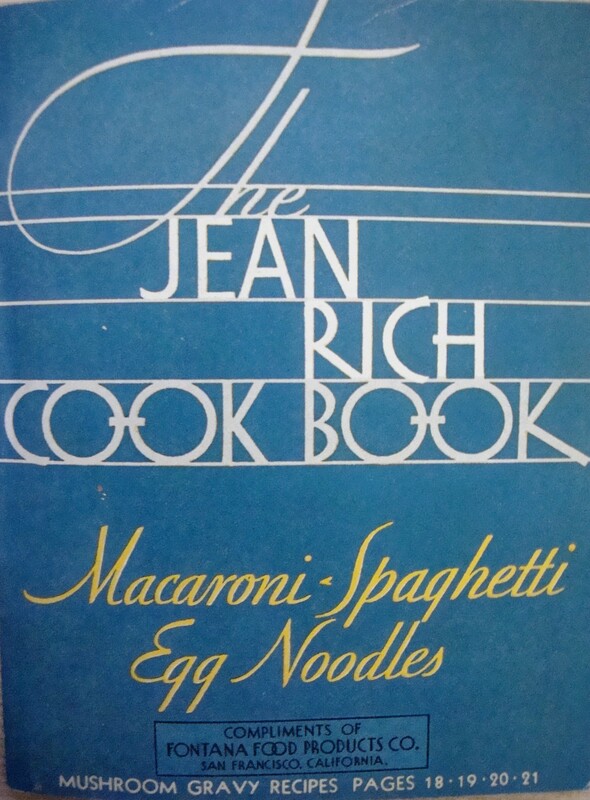 The booklet, “The Jean Rich Cook Book – Macaroni, Spaghetti, Egg Noodles” was published by Fontana Products around 1930 and features a number of innovative pasta dishes: “Macaroni Papoose”, “Egg Noodle Jelly with Cold Meats”, “Spaghetti Surprise” (the surprise is oysters), “Spaghetti Alaska”, “Spaghetti Balls”, “French Fried Egg Noodles”, “Spaghetti with Fresh Fruit”, “Quiver Salad”, “Egg Noodle Custard”, “Spaghetti Muffins” and “Egg Noodle Fruit Pudding“. Like Chef Robert Irvine is fond of saying on his TV show, “Restaurant Impossible” and others, he doesn’t like mixing sweet and savoury things together and I am in total agreement with him. Sweet is sweet and savoury is savoury and in my mouth, never the twain shall meet simultaneously! Thus, I have a big problem with the recipe for “Egg Noodle Jelly with Cold Meats”, which consists of lemon gelatine dessert, curry powder, lemon juice, chopped celery, stuffed olives and egg noodles. 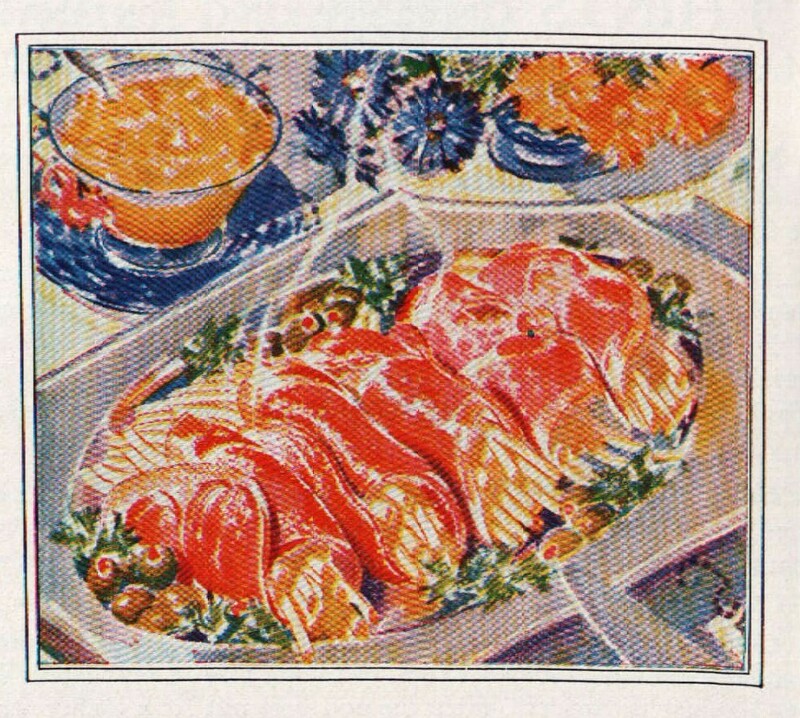 After cooling and unmolding, it is to be served with a cold meat platter. Noodles in lemon jelly? Here’s a way to use up that pesky leftover spaghetti! Just cut into ½ inch pieces and mix with flour, sugar, baking powder, an egg, and milk and pour into muffin cups. Presto: “al dente” muffins! “Spaghetti Alaska” contains the following ingredients: cooked spaghetti, canned salmon, grated onion, lemon juice, lemon gelatine, chopped celery, water, whipping cream, vinegar, mayonnaise, salt, pepper. Mix it all up, throw into a mold and chill. Yum. Don’t forget to sprinkle the border with paprika and some of the cream mixture. How about some “Spaghetti Balls” for breakfast? Cooked spaghetti, yeast, milk, sugar, eggs, flour, salt, shortening and baking powder. Mix it up and drop by spoonfuls into hot oil. Serve with powdered sugar. If you’re really ambitious and the family isn’t sick of spaghetti by dinnertime, you can whip up some “Egg Noodle Fruit Pudding”. Just add sugar, eggs, milk, chopped prunes, lemon juice, sugar, and chopped nuts. Bake until set, whip up some meringue to finish and you’ve got a dessert they’ll never forget. As Ron Popeil says “But, wait. 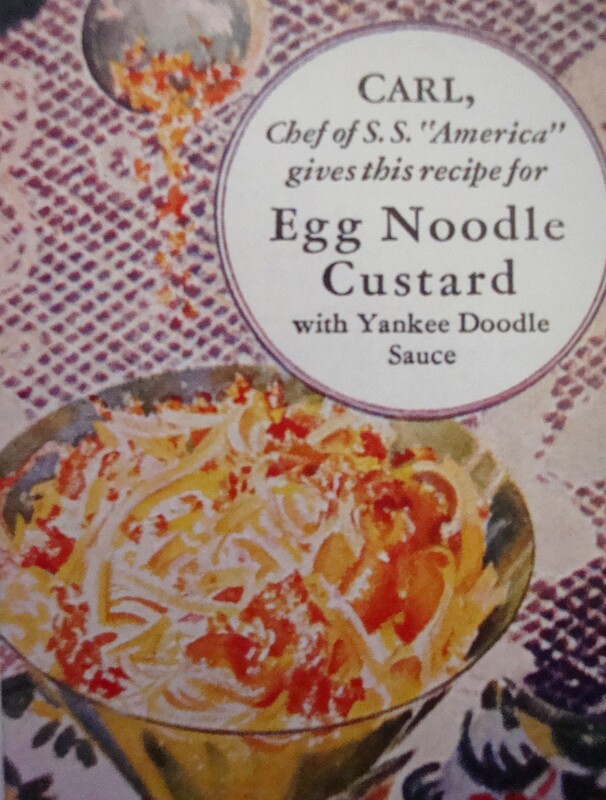 There’s more!” You could also try “Egg Noodle Custard with Yankee Doodle Sauce”. The “sauce” consists of candied ginger, orange rind, ground nuts and cinnamon. From “Apricots in Nests” to “Tomatoes Mayflower”, the Jean Rich Cook Book has it all! You’ll never look at spaghetti the same way again. 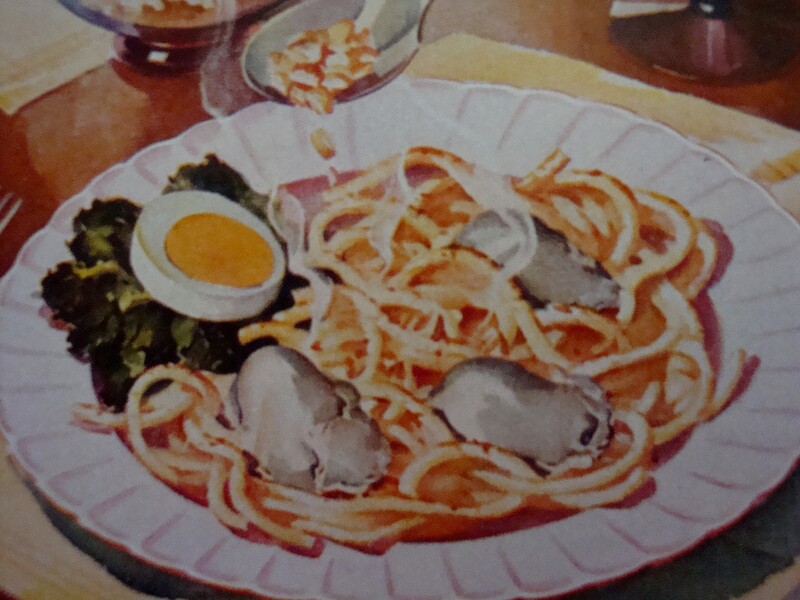 This entry was posted in Comfort Food, Cookbooks, Cooking, Eating, Food Trends, Menu Planning, Recipes, Uncategorized, Vintage Cookbooks and tagged 1930's, cookbooks, Cooking, Egg Noodles, Fontana Products, food history, Jean Rich, Pasta, social history, Spaghetti, Sue Jimenez, time capsules. Bookmark the permalink.